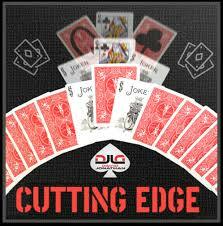 David Jonathan, known for popular effects like Wrong Turn and Arbitrium, among others.. is the creator of Cutting Edge. Cutting Edge isn’t really an effect… it is three different effects, similar to an extent, but each with methodology different enough to give the performer a choice of difficulty. Each has a slightly different ending, varying in its level of impossibility. DESTINED – Predict a freely isolated card with a stunning revelation! The Jokers are taken out of a deck and a spectator is invited to select a card. Their selection is shuffled back into the deck, then the cards are spread face down. The spectator is now asked to freely insert the Jokers face up around any card, isolating it from the others. This mystery card is now turned over to reveal that, incredibly, the spectator has found their selected card! If the effect ended right here, it would already be great… but in a jaw-dropping finale, the Jokers are then turned over to show the spectator’s card was predicted on the backs of the Jokers, proving everything was inevitable! 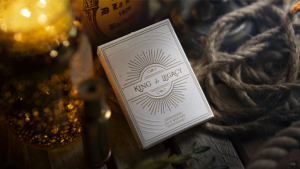 A CUT ABOVE – The spectator stabs a cut card into the pack directly above their selection, with a twist! A selected card is shuffled and lost into the deck. A casino cut card is now introduced and handed to the spectator to insert anywhere in the pack. Incredibly, the spectator’s card is found directly below the cut card! For a kicker climax, the cut card is then turned over to reveal a secret written prediction of the spectator’s card! This is the most logical and direct effect to use a casino cut card. THE FINAL CUT – The spectator cuts to their signed card from a deck they shuffled under test conditions! The spectator points to any card, signs it, and it is lost in the deck. A casino cut card (double blank card) is now introduced and set aside. 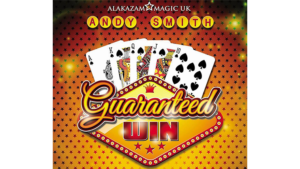 The deck is spread on the table and given a wash shuffle (as fair and genuine as they do in casinos) – the spectator can even help mix the cards. The cards are gathered and then ribbon spread across the table. The spectator now inserts the cut card anywhere they like into the spread. With no funny moves, the deck is cut directly where the cut card was inserted. The card right below the cut card is now turned over and, amazingly, it is the spectator’s signed card! Key Points: Both non-gimmicked and gaffed versions are taught on Cutting Edge. Multiple handlings are also included that are suitable for any skill level. All the effects can be performed In-The-Hands (no table required) and you can easily change the outcomes for each performance. I spent a fair amount of time watching David’s videos. All three arrived in an email along with two PDF files. One was an overview of the three effects with a brief step-by-step of each of the moves – great to follow as you’re remembering the videos. And the second PDF contained the links to the Vimeo vids of each of the three effects. Although you can watch them online.. I downloaded the three videos to store them in the folder with the PDF’s and not have to revisit Vimeo to clarify a point. The first effect, Destined, plays out exactly as described by David. The video quality is very good and the attention to details is all I would hope for.. No complaints at all. This is the more difficult of the three effects, but the most rewarding. You’ll spend more time learning the timing of the moves, but most are basic. There is a point where a pass of one form or another is needed, but David has simplified the handling as much as possible. This isn’t a deal breaker. Overall, Destined is a real fooler.. and one you can perform for both a lay audience and fellow magicians with equal aplomb. You will need to do a slight bit of simple artwork.. but it only requires a marker and two Jokers. Video length is 35 minutes. A Cut Above is slightly easier version of Destined and uses a ‘cut card’ instead of two Jokers. ( Don’t have a cut card? Glue two cards face to face and you’ll have a cut card..) The effect ends with the spectator’s selected card directly below the cut card.. inserted into the deck by the spectator.. instead of between the two Jokers as in the previous effect. The handling is noticeably easier, but it still carries an impressive impact. Perform it for audiences -and- magic friends. 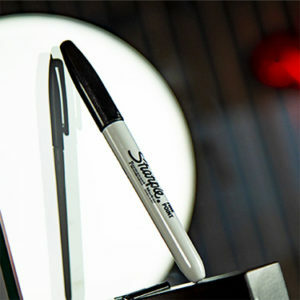 The Final Cut is the easiest of the three effects and, although similar in style to A Cut Above, uses a signed card as the locator card. I appreciate the time and effort David invested into this trilogy of effects. They work… and the end result is more than worth the effort. All three are very creditable methods of revealing a spectator’s chosen card. I’m convinced you’ll find a favorite and add it to your repertoire… maybe a couple even.